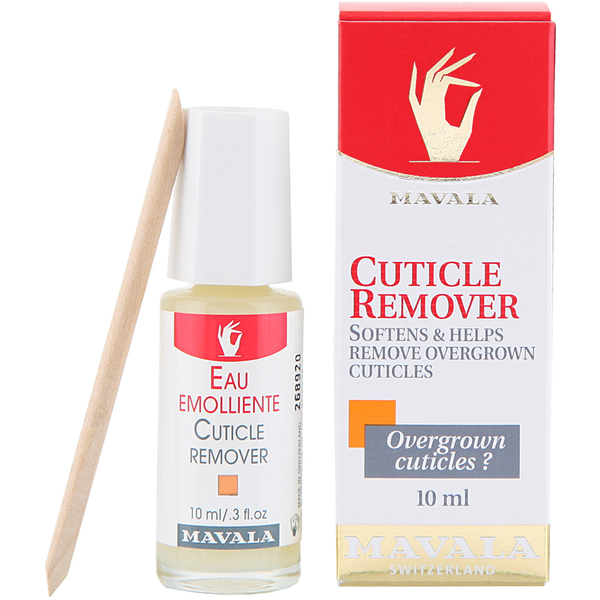 Mavala's Cuticle Remover softens and helps remove overgrown cuticles in one application. Apply directly on cuticles with the brush. In a few seconds overgrown cuticles are softened and can be "erased" with a manicure stick wrapped in cotton. Apply one coat with the brush around the clean contour of the nail. Allow to act for one minute and then gently roll back the cuticle with a manicure stick covered with cotton wool. Wash well with soapy water and dry nails before continuing with manicure. Never use a metal instrument to push back cuticle, as this can injure the nail matrix. It is not recommended to use this product on inflamed or injured skin.